I was really up in the air about whether to do this tutorial – i kind of feel like every person with a craft blog has a tutorial for this… haha oh well! Let’s go for it anyway shall we? This project kinda served 2 purposes. 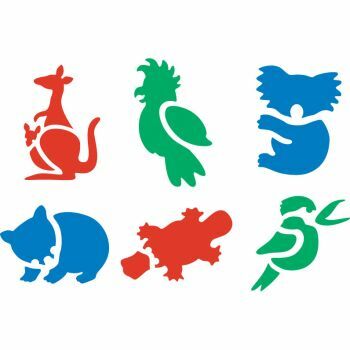 1) Bunny is obsessed with Australian animals (what?!? brainwashing you say?? 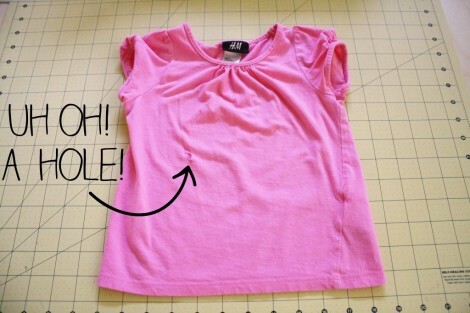 i have no idea what you’re talking about… hehehe) and 2) this shirt got a hole in the front, and i wanted to save it. 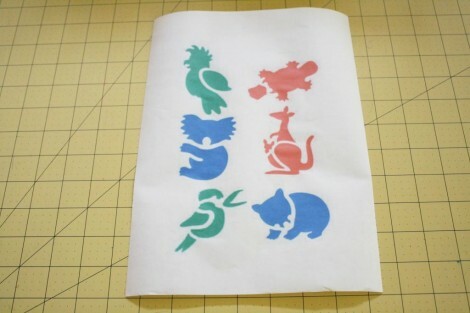 So I found some free stencils online (i’m so sorry, but i didn’t save the link and can’t seem to find it again – if i find it i will update the post with the link – see this is why Pinterest is so awesome, i don’t lose links anymore!) – and did the stenciling on all but 1. For the animal over the hole, i cut it out of felt and sewed it (meh, not particularly happy with how that part turned out). 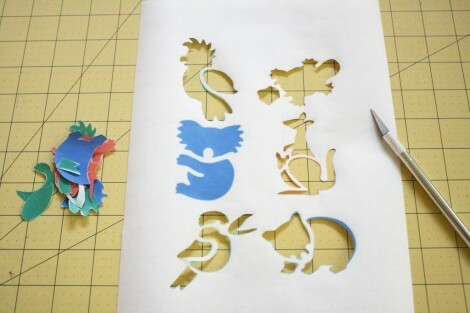 Cut out your design using an exacto knife or craft knife. Be careful, i cut myself (sad face). 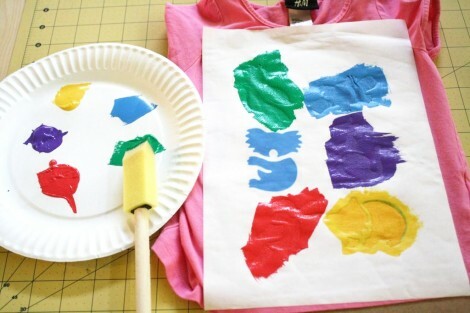 Using your iron (on the dry setting, no steam please), iron the freezer paper to your fabric or shirt so that the shiny side is touching the fabric. It should stick nicely! Paint! I like using these foamy brushes, and i normally like to do about 2 layers of paint (leaving time to dry in between). 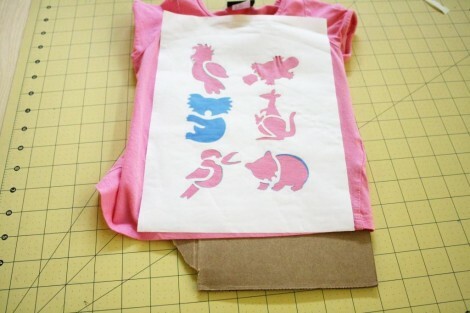 When your shirt is totally dry carefully peel off your stencil. 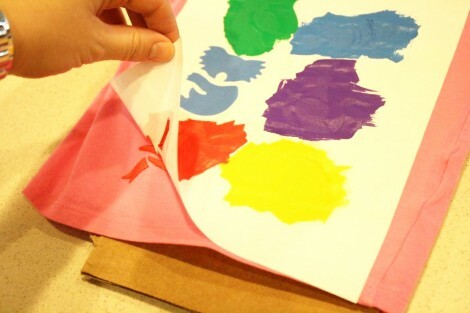 Heat set your design – do this by placing a scrap of fabric or a presser cloth over it and ironing. 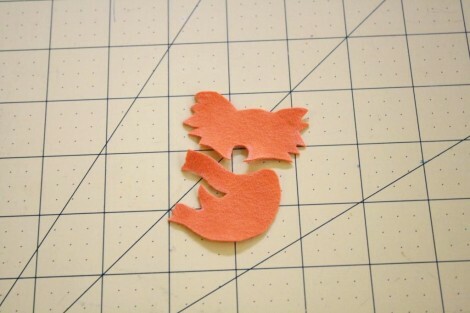 If like me you are sewing an applique as part of your design, then cut it out using felt, and sew that sucker in place! 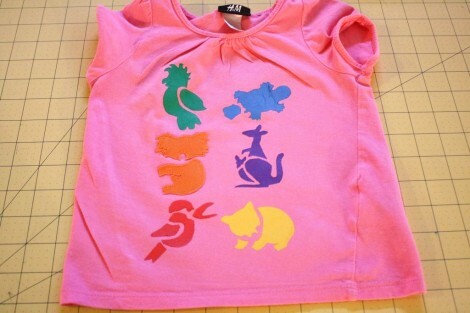 As a side note: You may have noticed that the shirt looks off centre… yep this is driving me crazy. As i started the project i realised that the shirt was cut off grain when it was made – which means that it now naturally hangs with the left side seams towards the front. 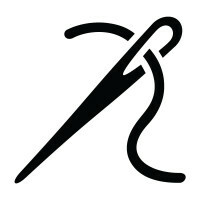 So there you go – even big companies sometimes cut things off grain, and make stupid sewing mistakes… not that that makes it okay. Brainwashing with regards to anything Australian is awesome….oh yes, the shirt is adorable too!!!!!! well I’m brainwashed… Please take to Australia. I love this idea. 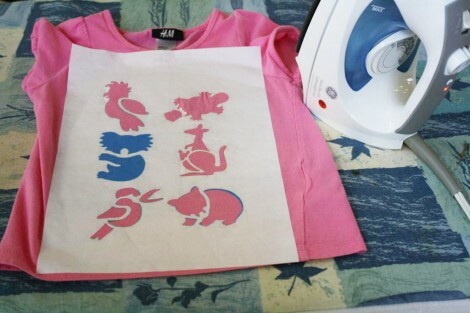 I saw someone on TV use the outlines (with punched out dotted holes (along the outline) – instead of using a knife)to use as a stencil, brushed with chalk into holes, to mark the outline onto fabric, then sew the design. 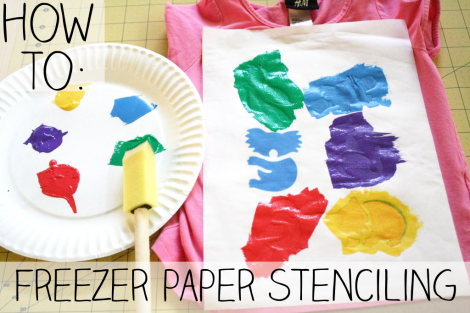 Using freezer paper with this idea in mind, allows you to print any design off the computer and use it on your project. Only wanna remark that you have a very decent website , I enjoy the layout it really stands out.